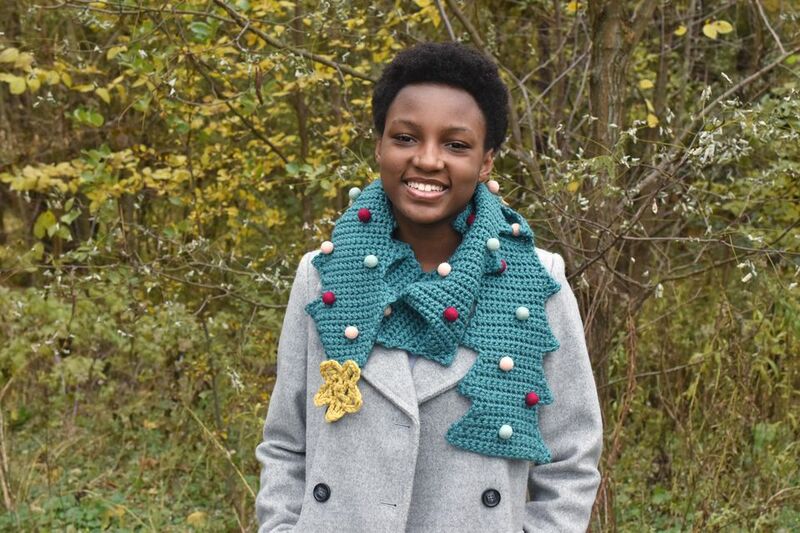 Wrap yourself in festivity when you crochet this fast and easy Christmas Tree scarf! If you know basic crochet stitches, you can make this—and working with bulky yarn means you can build the rows quickly. You can even make a few for gifts with time to spare. A few fun details let you decorate your tree with your own fun style! Wear your scarf to a holiday parade or tree-lighting to show your Christmas cheer, or add this as a fun accessory for all those holiday parties on your calendar. Ready to get started? 11 stitches and 10 rows = 4in/10cm in single crochet. Approximately 7in x 68in (18cm x 170cm) when the star is attached. Note: All instructions use US crochet terms. Chain 18 for a starting chain. Row 1: sc across the row, starting with the 2nd stitch from the hook. ch 1 for a turning chain. Turn. Rows 2-7: sc2tog, then sc across the row. ch 1 for a turning chain. Turn. Row 8: sc across the row. ch 4 to increase. Turn. Row 9: sc across the row, starting with the 2nd stitch from the hook. ch 4 to increase. Turn. Row 10: sc across the row, starting with the 2nd stitch from the hook and stopping 2 stitches from the end. sc2tog. ch 1 for a turning chain. Turn. You should now have 17 stitches across. Rows 11-15: sc across the row, stopping 2 stitches from the end. sc2tog. ch 1 for a turning chain. Turn. You should now have 12 stitches across. Repeat rows 8-15, 18 times. Tree Top Rows: sc across the row, stopping 2 stitches from the end. sc2tog. ch 1 for a turning chain. Turn. Repeat until 1 stitch remains. Secure the last stitch, leaving at least 6 inches of yarn. ​Weave in all the ends and block the scarf. What's a Christmas tree without a star on top? Crochet this simple 5-point star for the end of your scarf, and then make a few more for decorations on your actual tree too! The pattern works for other weights of yarn as long as you use a hook size that matches the yarn. ch 4 and sl st to join. Round 1: ch 4 (counts as first dc and chs), *dc into center, ch 2*. Rep between * 4 times total. sl st in first dc. Round 2: ch 3, tc into ch-2 sp, ch 3, sl st in dc* Rep between * 5 times total. Secure the last stitch, leaving at least 6 inches of yarn. Weave in all the ends and block the star so the points are even. When blocking, pin at the center and at each point and indent. Place the star at the top of the tree so the point of the tree is at about the center of the star. You can place the star a little lower if you'd like. Stitch the star to the tree with matching green embroidery floss. Work through the stitches so that the thread doesn't show on the front of the star. Secure the end with a knot on the back. Scatter the pompoms on the tree and stitch them in place. Draw the embroidery needle and embroidery floss through the pom pom, then stitch through the crochet stitches. Stitch through 2 to 3 times each so they hold on tight. Knot the end close to the pom pom and trim the excess thread, making sure you don't snip the crochet. You could attach the pom poms with fabric glue to save time, but stitching them is more secure. Make your scarf longer or shorter by adding or subtracting repeats on the tree. If you make yours longer, you will need more yarn. Skip the star and use all white or light blue pompoms to transform your scarf into a winter tree. Want more decorations on your Christmas Tree scarf? 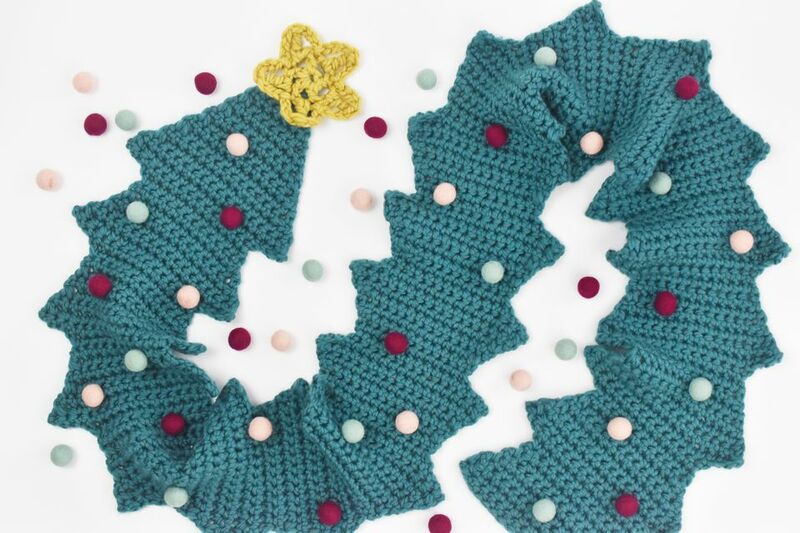 Use slip stitch surface crochet to add "garland" to your tree!